Take a cruise through our fresh new site! Check it out! VegFund’s all-new website, new grant system, and new activist forum. We invite you to celebrate what we’ve designed for you, inspired by you — our grantees. We reconceived VegFund’s technology platforms over the past year to foster connections and improve our support of the global force of individuals and organizations who communicate their passion for vegan living in partnership with VegFund’s grant programs. The new website was rebuilt from scratch for improved ease-of-use and with expanded grantee support material and information that we hope will inspire you to take your great work to new levels. Our current grantees should note that we’ve both expanded our grant categories and redefined a few. We’ve redesigned our grant application and management system to make the process smoother for you — and for us! You can access the new grant management program directly at vegfund.fluidreview.com or via the Apply/Login buttons on the website. The VegFund staff is here to help. if you encounter any problems applying for a grant in the new system. Note: Previous applications made through VegFund’s old grant application system, Foundant, will not be accessible via the new grant management system, Fluid Review. To view these previous applications, please access them via the old grant system, here. Looking for materials to assist you in your advocacy efforts? 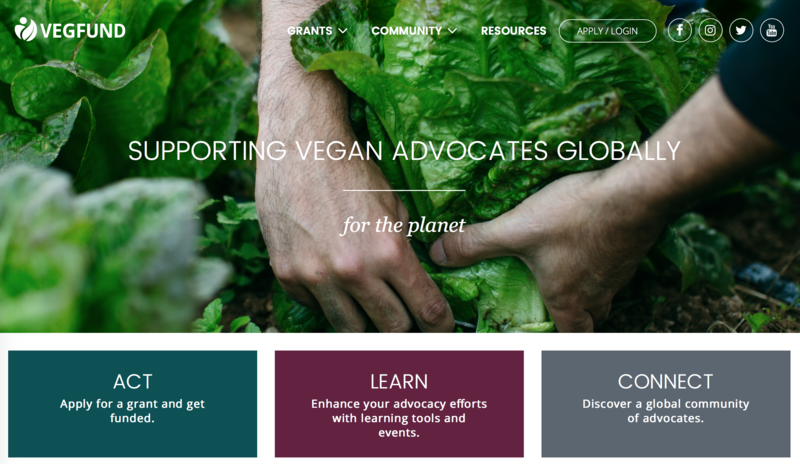 Our Resources section contains a library of tips and tools to enhance your abilities to communicate effectively as an advocate for vegan and plant-based living. Online resources (including toolkits, tips sheets, and the latest research and data). VegFund will be adding to this archive of resources on a regular basis with a series of trainings and other support offerings. Watch for the schedule in the News section of the website and in our newsletter. If you know of other valuable advocacy resources you’d like to see included in this section, please let us know. We love hearing from our grantees. VegFund’s community of grantees has voiced a keen interest in connecting and collaborating with others activists and powering up their outreach. In response, we’ve added a “Community” section to the website to highlight your excellent work and foster exchange of ideas and skills — and, we hope, to inspire new activists and ever-more-effective activism. Drawing from a pool of successful and diverse VegFund grant activities, our Activist Stories section showcases the outreach activities of vegan activists across the world in their work to encourage people to adopt and maintain a vegan lifestyle. Thanks to all of the grantees whose informative event recaps have made this section possible. We look forward to highlighting the work of many more VegFund grantees in the near future. Keep up-to-date with what’s going on around the globe within the VegFund community! The Events calendar highlights grantees’ upcoming activities and even includes shout-outs for volunteers. The Vegfest Organizers Network is designed to foster collective learning specifically among vegfest practitioners and contribute to the development of vegfests around the globe. The Vegan Activist Forum is a place for vegan activists and advocates of all kinds to share their visions and exchange ideas. The discussion forums can be accessed from the website or directly at https://forum.vegfund.org. This is the place to share your knowledge, collaborate, and ask for input on anything from attracting non-vegans to your event to how to deal with difficult questions from the public. Register today and help get the conversation going. Start a topic, respond to a post — let’s talk! VegFund welcomes your comments and suggestions. Let us know what’s working well for you and how we can continue to adapt our online systems to serve our grantees better. You can contact us at any time. Thank you for visiting. We hope your virtual visit to VegFund inspires you to embrace your passion and energy to help animals, the environment, and people… creating a more compassionate world for all.